Last edited by padsiderob on Tue Aug 14, 2018 9:54 pm, edited 1 time in total. Hi Robin and welcome somebody on here will be able to identify your dumper for you. Last edited by XS650 on Wed Aug 15, 2018 10:54 am, edited 2 times in total. 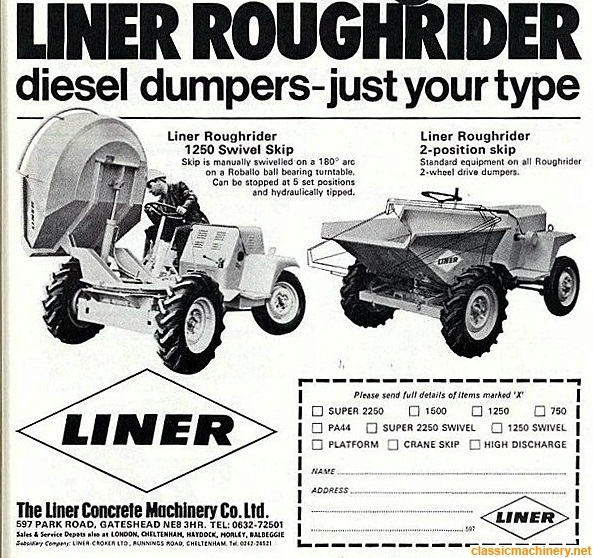 See pic below ,looks like the dumper on the right with similar skip from the one on the left , maybe they made a 750 Swivel Skip . Thanks guys, guessed it was a liner but not able to find which particular model. They seem to be fairly rare as they done come up much on ebay or other auction sites. padsiderob wrote: Thanks guys, guessed it was a liner but not able to find which particular model. They seem to be fairly rare as they done come up much on ebay or other auction sites. There is a good chance that other CMN members may own a similar dumper plus there are those like Fred Evans who have plenty of working experience in plant having been in the game and having owned his own company so just ask any questions you may have I am sure somebody on here will be able to help you; also if you have plenty of free time trawl through the dumper posts and topics you may find more info there.